A sports bra is the cornerstone of every gym kit. You want something that offers ample support without rendering you stiff and unable to stretch your arms. You're also after something that can handle being washed often and doesn't mind spending days rattling around your bag with your less-than-gentle trainers. And while it isn't always the top priority over functionality, we all want something that actually looks good too, even if we're not fans of gym selfies. Like all new investments, it's best to seek peer recs when shopping for a new sports bra. And that's exactly what we've done. We've called upon the fittest women we know—from marathon runners to HIIT addicts—to tell us about the sports bras they rely on. "Sweaty Betty is known for quality activewear. I love that this bra is reversible; I tend to only wear black workout wear, but it's good to have the option of a pop of colour every now and again. It also don't have anything unnecessary about it like extra straps or bits hanging off, which to me is exactly what activewear should be—practical and comfortable. If it can be pretty and flattering too, that's an added bonus!" "My favourite sports bra has to be the Nike Classic Swoosh (£27). It's a simple bra designed for medium-impact sports; however, as small-chested woman, I find it provides me the most perfect level of support and comfort for all my runs. Nike DriFit technology is always advancing, and the bra seems to be getting better and better at sweat-wicking. I'm dry within a short period of time after training, and I never experience chaffing from this style, no matter the distance I cover." "This sports bra got me through two marathons and quite a fair few runs in between. If you're looking for something that supports you while you run (read: stops the bounce and jiggle) without feeling restrictive, tight or uncomfortable, this is the bra for you. It's also great for high-intensity workout classes too." "I've always considered myself pretty fit, but I quickly realised my mind, body and, in fact, sportswear would be stretched to whole new levels thanks to endurance test that is marathon training. For me, and being admittedly swayed easily by new brands and fashion, Sweaty Betty ticks all my boxes, delivering both fashion and functional wear. I've been training for the final few weeks in the lead-up to marathon day in its Infinity Workout Bras teamed with a Breeze Run Vest (£65), which have made for the perfect combo. I may have also treated myself to the brand's limited-edition Union Jack–printed Infinity Bra (£50) for the main event. With the queen cutting the ribbon on race day, I couldn't resist having a little fun with my kit and making the patriotic purchase!" 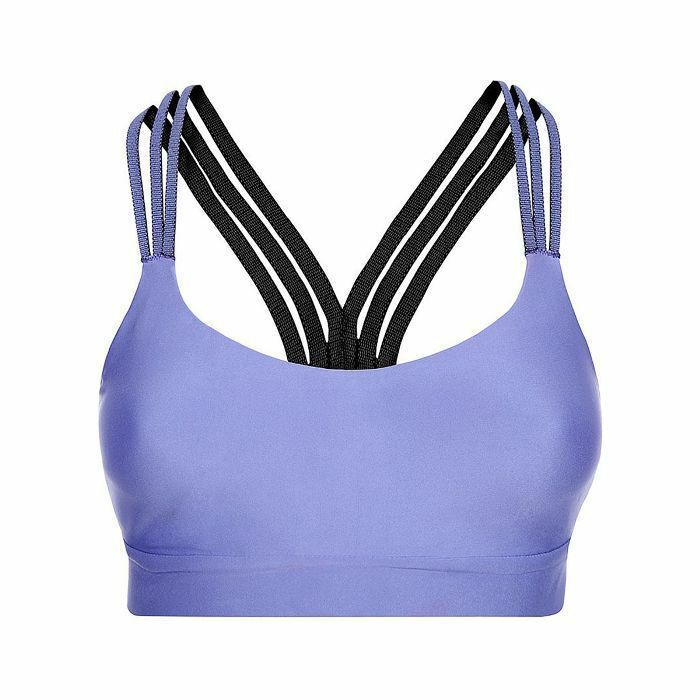 "This is one of the few sports bras that gives me full support when I'm smashing out a HIIT session, yet it doesn't feel bulky or overly padded. I pretty much wear activewear 24/7, and what makes this bra a favourite is the fact it can be worn everyday too, and styled with jeans, a baggy top and boots. I'm obsessed with the white-and–pastel blue combo, too—the ultimate motivation to get a tanned and toned upper body." "On any given week, I work out around four to five times, which means I practically wear (and wash) my sports bras most nights. Because of that, I need something that feels comfortable but doesn't break the bank either. My favourite is the Nike Classic Swoosh Medium-Support bra. It comes in my favourite range of workout colours (black, white and grey—what can I say, I'm minimal) and makes me feel supported without feeling restricted when running or doing a burpee during my favourite HIIT class. Basically, it's the perfect suits-all workouts bra, and I have at least 6." So now you know which sports bras you can truly rely on. And besides, investing in new kit is the best motivation to get back on the fitness bandwagon, right?